CREATE A RELAXING SPACE: Bring the aquarium to your home or office with the Electric Jellyfish Mood Light. It contains all the peaceful relaxation of watching elegant sea life in the aquarium in a beautiful home decor piece. It pairs perfectly with any kind of interior design theme. CAPTURE THE BEAUTY OF REAL JELLYFISH: Jellyfish are some of the most majestic creatures in the world, so Fascinations wanted to portray them in all their delicate splendor. They modeled to be as lifelike as possible in both appearance and movement for complete accuracy. TRANQUIL MOOD LIGHTING: The Electric Jellyfish Mood Light contains 18 LED lights for complete illumination of the jellyfish. Select your ideal light setting and allow the jellyfish to gracefully to provide you with perfect ambiance and atmosphere wherever you choose. NEAR SILENT OPERATION: Fascinations does an excellent job in providing you with the most peaceful product they can. The Jellyfish Mood Light operates without any bothersome motor or movement sounds, creating the ultimate relaxing decoration in your home or office. 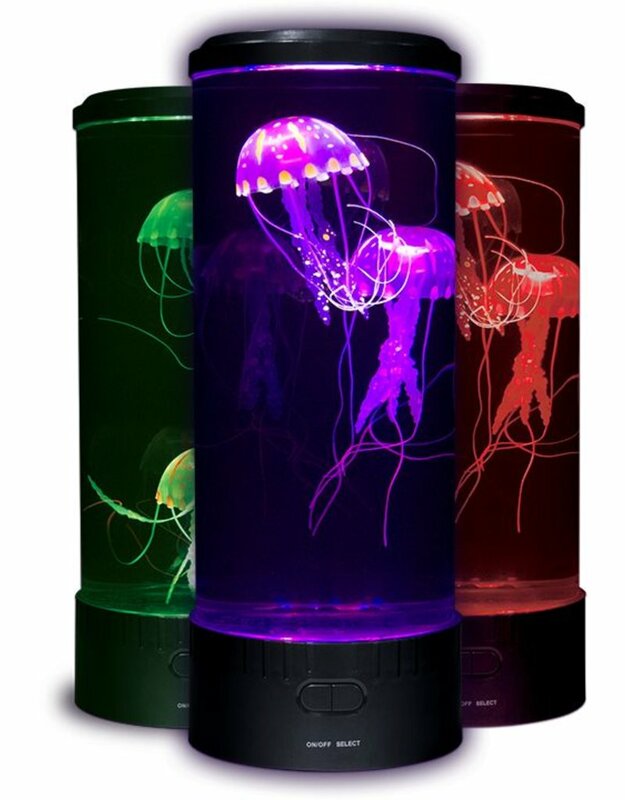 PRODUCT SPECIFICATIONS: Package contains (1) Fascinations Electric Jellyfish Mood Light. Creates the Perfect Soothing Ambience. 2 Realistic Jellyfish. Illuminated With 18 LEDs. Auto-Shutoff. Instructions Included. Low Voltage Adapter Included. This is not a toy. This item is a museum-quality luminary.